This guide will walk you through how to start using dolphinNext pipelines and creating new pipelines. First off, you need to enter dolphinNext web page: https://dolphinnext.umassmed.edu/ and click Sign Up or Sign in with Google buttons. You will be asked to enter your institute information. An email will be sent to you upon verification of your information. To run existing pipelines, you need to create run environment in profile section. To do so, click on the profile button at the top right of the screen, then you’ll notice several tabs as shown below. Follow through the steps in profile page to create SSH Key (optionally, Amazon Key) and then specify the hosts you want to use in run environments section. Once you complete these steps, you’re now able to submit jobs to specifed hosts. 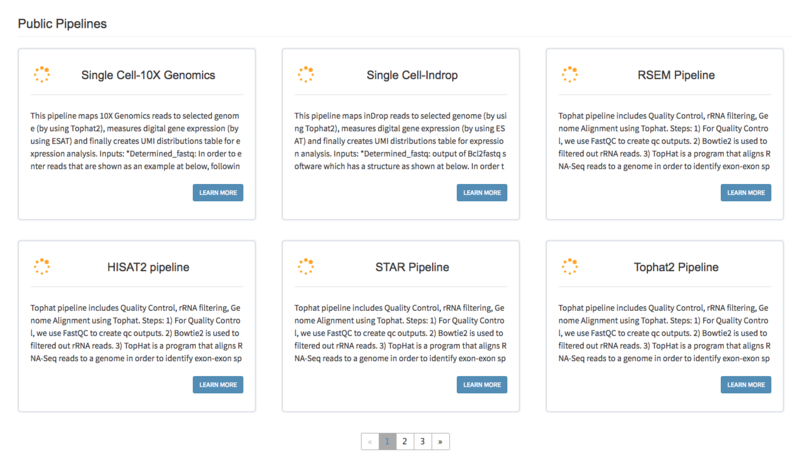 The easiest way to run pipeline is going to use main page by clicking the Biocore DolphinNext button at the top left of the screen. Now, you can investigate publicly available pipelines as shown at below and select the pipeline you want run by clicking Learn More button. Once pipeline is loaded, you will notice “Run” button at the right top of the page. In the header of the run page, you will notice the rocket icon and the title of the run. Once all requirements are satisfied, ``Waiting`` button will turn in to green ``ready to run`` button as shown below. You can initiate your run by clicking ready to run button. Please go through run page for detailed explanation about each module is used. The simpliest way to edit pipelines is creating a copy of the existing ones by clicking copy pipeline icon which is located just next to pipeline title. Similarly you can create a copy of process by clicking copy process button on the top right of the process window. Once you copied the pipeline/process, you will own all the permissions of your process/pipeline and you can easily modify and save on your version.